Finalists were joined by dignitaries, sponsors, judges and supporters at a black-tie event held at Blackburn Cathedral where the winners were announced and celebrated on stage. The awards were held in association with Blackburn College, Capita and Blackburn with Darwen Borough Council. Finalists underwent a rigorous judging process at Northcote at the Rovers which sorted the good from the great across a range of categories, including titles for those that showed the most creativity, manufacturing excellence and high growth, as well as young entrepreneur and young employee awards for individuals. There were also two special awards; the Hive Chairman’s Award, won by Darwen-based soft furnishing firm Hebert Parkinson, and the Arte et Labore award, won by Canon Andrew Hindley of Blackburn Cathedral. 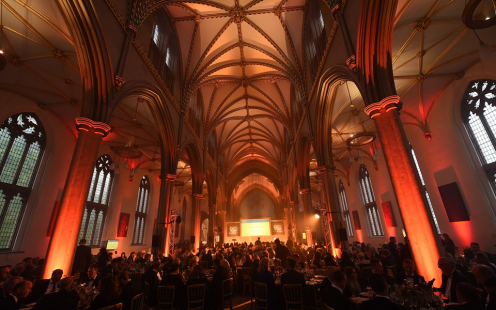 The awards really highlight the fantastic businesses we have within the borough and we’re pleased they’ve taken this opportunity to shout about what they do and celebrate the extraordinary people working for them. Our aim is to showcase the fantastic work being undertaken within the borough, and anybody who looks at the list of finalists and winners will realise what a truly special place Blackburn with Darwen is to do business. The host for the evening was ITV weather presenter Emma Jesson, with former High Sheriff Ann Jordan, a non-executive director for the Institute of Directors and chairman of the Blackburn Cathedral Appeal Board of Trustees, as guest speaker. There was also entertainment from local performers including the Paul Rigby Quartet and Hannah Spurgeon. 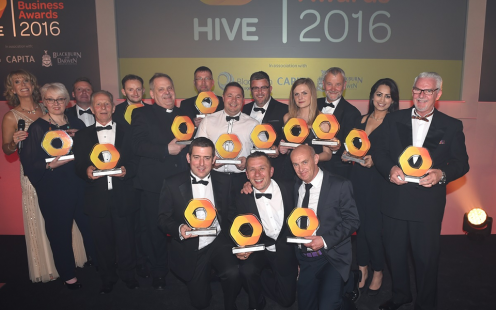 Headline sponsors of the Hive Blackburn and Darwen Business Awards are Blackburn College, Capita and Blackburn with Darwen Borough Council. The awards are also sponsored by Business and Enterprise Trust, East Lancashire Chamber of Commerce, Forbes Solicitors, Heritage Envelopes, Maple Grove Developments, Napthens Solicitors, Northcote at the Rovers, Parkinson Signs, Pierce Chartered Accountants, Precision Polymer Engineering (PPE), Ronset, Tauheedul Education Trust, WEC Group, Whittle Jones and With a Twist, with media partners including Lancashire Telegraph, The Bee, Square Cactus and Lancashire Business View.